The Broncos have now ended two teams’ winning streaks, back-to-back. DENVER — For a man who tips the scales at close to 300 pounds, nose tackle Shelby Harris sure gets overlooked a lot. Ben Roethlisberger didn’t see him Sunday when Harris intercepted his pass to Antonio Brown from the Denver 2 with 1:03 remaining, sealing the Broncos’ 24-17 win that snapped the Pittsburgh Steelers‘ six-game winning streak. The Broncos (5-6), who ended the Chargers’ six-game winning streak last week, weren’t surprised by Harris’ big play. “I got to prove to everyone that I have the best hands on the team,” Harris said of his first career interception, which came 48 hours after he missed Friday’s practice for the birth of his daughter. “It’s going to be a quiet plane ride home,” said Smith-Schuster, whose 13 catches for 189 yards weren’t enough to keep Pittsburgh from losing for just the second time in its last 18 regular-season road games. 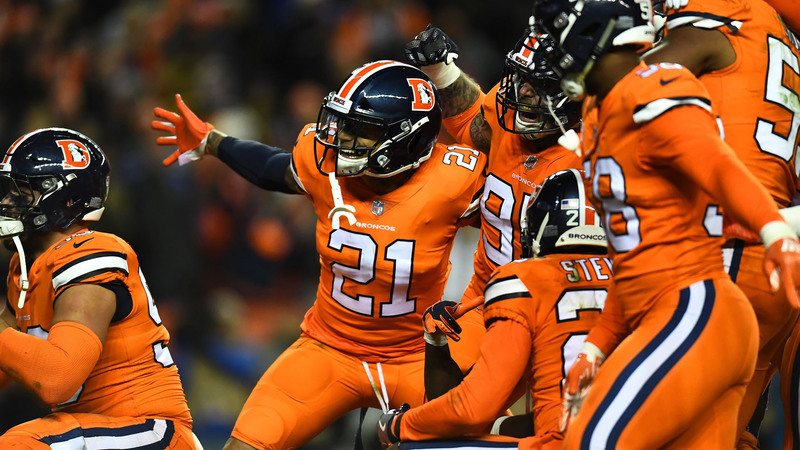 Cornerback Bradley Roby and safety Darian Stewart were burned on Smith-Schuster’s long touchdown grab, but they made up for it when they teamed up on the final play of the third quarter for Denver’s third takeaway . “I knew I had to do something,” said Roby, who forced James Connor to cough up the football after a 23-yard gain. Stewart recovered it at the Denver 21. Smith-Schuster, who raced past Roby, hauled it in at the Pittsburgh 35, cut toward the Broncos’ sideline and stiff-armed Stewart on his way to breaking a 10-10 tie. His 97-yard TD matched the longest pass play in franchise history, and was one yard shy of the longest TD the Broncos had ever surrendered, a 98-yard run by Green Bay’s Ahman Green in 2003. Boswell took the direct snap and threw a perfect pass to a wide-open Villanueva — who was a receiver and tight end at Army and became the first Steelers O-lineman to catch a touchdown pass since Ray Pinney against the Browns in 1983. “It was cool to see all the guys get excited like that for me, especially because I think I dropped it in practice last week,” Villanueva said. Justin Simmons blocked Boswell’s 48-yard field goal attempt and safety Will Parks punched away the football just as tight end Xavier Grimble was about to score on a 24-yard catch-and-run. The ball went out of bounds in the end zone for a touchback. Broncos: CB Tramaine Brock (ribs), TE Jeff Heuerman (torso) and OLB Shaq Barrett (hip) didn’t return to action after getting hurt. Broncos: Travel to Cincinnati to face the league’s worst defense.